It's pretty apparent by now that I have yet to meet a double denim combo that I don't like. And probably a red accessory, for that matter. While it is true that denim and red are slowly creeping their way to exclusivity in my closet, I still just can't seem to get sick of either of them. Then again, I think it's hard to get sick of anything that's a classic. 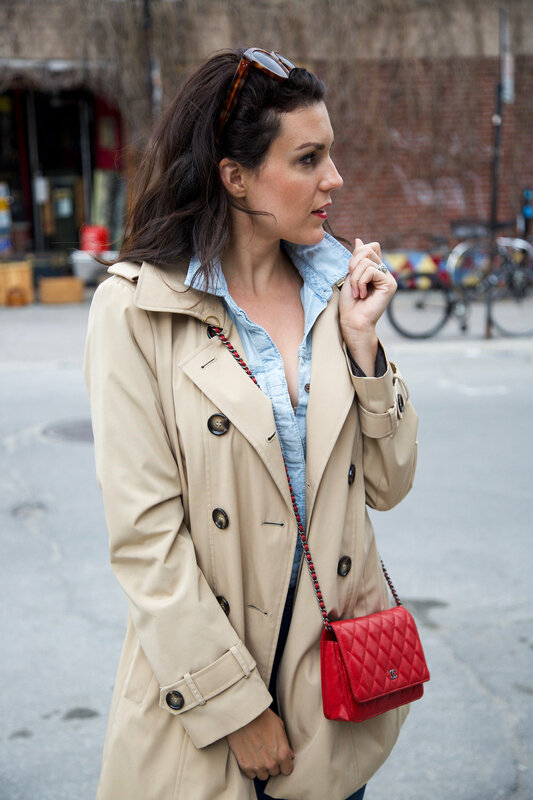 Recently, I paired allll the denim things with allllll the red things and threw on another classic, a trench coat, for a spring outfit that was just what a day of exploring in Montreal called for. The outfit took me from brunch to shopping to walking to drinks and back (You can see more Montreal pictures and recommendations here.). And that versatility, right there, is exactly why I just can't quit my denim and red. What pieces in your closet are ones you just can't stop wearing?